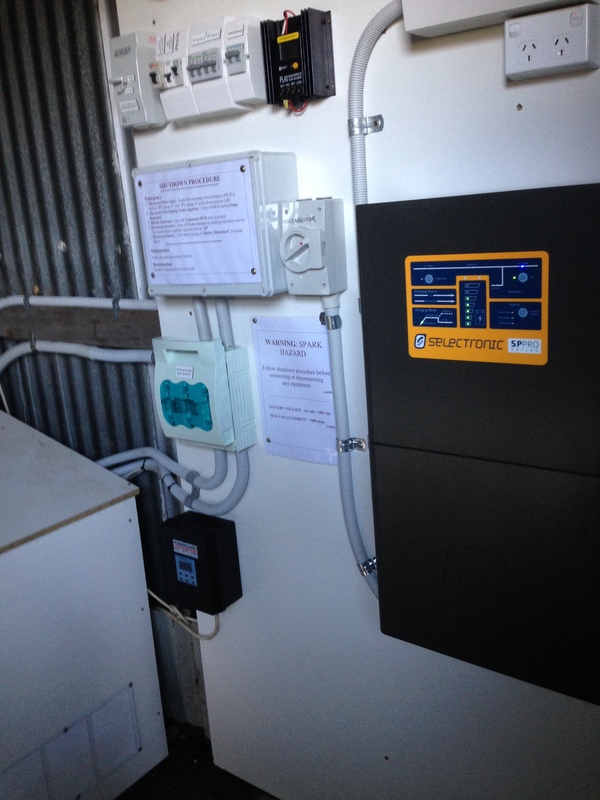 Recently, an off-grid customer from Bellbrae called up and related the fact that his Selectronic SPPro had displayed a warning light. The power was still on etc and could you come down and have a look and find out why! I packed my laptop into the Radiant van and headed off. When I got there, the inverter was showing 100% in the batteries and no signs of the warning light. The next step was to connect the laptop, run SPLink and download the data held on board the SPPro. I selected Performance Data and then Custom Download and then set the Time Period to span the last 14 days. The tip is to only download enough data to check for the fault period as Downloading All Data takes much longer!! Once the data set was downloaded, I pressed Launch Performance Viewer – this starts up SP link’s graphing program in Excel. You have to Enable Content which will then allow a range of pre-populated graphs to be displayed. I chose Battery Voltage and Net DC Amps which displayed the ranges of battery voltages for the past 2 weeks. Sure enough, one of the days showed a battery voltage that was well above normal. Looking into the charge settings on the Plasmatronics PL40 solar regulator showed that the equalization voltage was 31 volts – too high . The alarm setting on the SPPro inverter battery voltage was set to 29.5 – perhaps a little too low. The graph also shows the State Of Charge in the battery. It hadn’t moved below 90% over the past 14 days – very good. We specify in our system user manuals that the battery is not to get below 80%. This is to ensure optimum battery life. An auto-start generator is a good way of both automating the charging requirements and to extend battery life. Most systems that we install now have an auto-start generator attached. As everything else looked OK it was job Done!